My art has a 1 year warranty against build defects I had control over at time of build (from time of shipping notice). Drivers, pads, parts that I don't make, broken cables… may be available at a cost (I may have a solution if you email or read below for cable replacement policy). Proper care of art is required and gone over on this page farther down. Any refunds requested/given within 3 days of time of purchase may be charged a fee by PayPal (which is your responsibility if they do). Refund is usually same day, but could take up to seven days. If refund is not requested within 3 days of purchase, a credit will go on file for you if you wish to cancel current build. This credit must be used within one year or it will become my property to do with what I wish. All sales are final, no returns, demos or exchanges. I reserve the right to refuse or limit orders. Items are not packed for retail, nor usually with any package other than shipping materials and box. My private shop (headphile) is located in the Cascade Range Foothills NE of Seattle, Washington USA. Some items may require different/additional postage. No shipping to Argentina and possibly some other places. If you invest in a quality cable, treat it as such for long life. Headphile cables should not be bundled, wrapped in a figure eight, wrapped around headphones, twisted over or kinked at right angles. Storage of cable should only be circular, no less than 3-4" circumference. When the cable is shipped to you, it will be in this natural position and should continue to be stored or transported in this way. You can kink a cable permanently the first moment you use it if you treat it like a lamp cord! Replacement Policy… If you are the original purchaser of a headphile cable (I will look it up), you are possibly eligible for a one-time discount to have your cable replaced for half current price (plus shipping). Old cable must be returned in it's stock condition (not have been tampered with, modified, or attempted fix) before a build will start. Configuration change is allowed (length, Series, termination), but credit towards that is half of original cable price only... and only up to half the cost of new cable chosen, if it costs less than original. Method of Payment... This website uses PayPal shopping cart system. They allow you to use MasterCard, Visa, Discover, American Express, Bank Account, Existing PayPal balance, E-Check and possibly other options. I also accept USPS Money Orders (purchased at US Post Office only) or US Cash (email info@headphile.com for those). How Do I buy from your site… Select what you want with radio buttons / check boxes and push add to cart. Each section is separate, so requires multiple purchase if for example, you want a Darth Beyer V7 and matching stand. All Products are Art… Most all of my art has an alternate function, but I consider all purchases that of art. Whether you use a product as art or function is solely up to you. Like any art, only time will tell if it's value rises or falls. An example is some have used a modest amount of dollars for paint and canvas… but their art can be worth millions, not the materials used. What method of shipping do you use, and how long will it take in transit… USPS Priority mostly. Usually arrives in 2-3 days in USA. Global Express (EMS) 5-7 days rest of the world. Global Priority to rest of world is taking on average around 17-10 days lately (as quick as 5 days, long as 30 days). I can't ship FedEx, UPS or other, but they do deliver to me. I reserve the right to not ship to some countries at my sole discretion, Argentina is one I no longer ship to. I will email tracking numbers when shipping (if applicable). Can I buy just woodies or pads... No, with exception to Sennheiser and K340 woodies, possibly deal page too. They can be purchased for self install and don't require cable purchase. Black headphile Beyer Velour pads are not currently available separate. Mini plugs… I put on straight mini plugs as standard. Right angle plugs are additional, ask if they are feasible for your cable if desired. Cable length, is it exactly the length specified… Cable length is determined by the length of Teflon sleeving used as the dielectric for the solid wire. So in essence, most all interconnects will be slightly longer than length stated. Headphone cables are the same way, though aprox 3" (or more) will be in the headphone itself. Headphone cables are NOT measured from the splitter, but rather from the soldered driver lugs (typically 3" inside cups) to plug contacts. Do you recable K701, SA5000, AT, Ultrasone (along with some others)… Not at this time. Is wood going to look the same in person… Typically wood looks better in person. It is hard to capture both the color and especially something like figuring (moving grain) of the wood. Grain changes in light, color can too. Every board is somewhat different in some way, some lighter, some darker, some more grain, etc. I try to use the grain in the most artistic way I can (some wood I don't use at all). Occasionally wood will have a blemish, crack or flaw (that I may fill). I will make a judgment call and if I feel it's not acceptable, in the wood stove it will go. If I ship an order, I've found it to be acceptable art to me. What is a CJC and Splitter… A CJC (cable junction cover) is the wood piece that optionally resides between the cable identifier sleeve and the main run. On cable page, you can see where it is placed (red dot opposite plug) and there are numerous pics on this site showing a CJC (and splitter) on various cables. Splitter (made of wood as an option) resides where main cable run splits into left and right approx 18" below headphone entry point. PHOTO of CJC and splitter. Got this cool wood, can I send it to you?! ?… Probably not... Do you take food to a restaurant and ask them to cook it? They'd say no too :-) I use only wood that I have on hand here, that I've picked out myself and have successfully worked with. Are the pics of art products current… Mostly, but not always... sometimes art products change before I can change pics. Since most items are hand built, they may vary in look, style or what I feel is an improvement at anytime at my discretion. Do you give discounts… No, I don't discount. Quality of art would suffer, (a natural response I'd say) so I don't offer discounts. Sometimes there are some pretty kickin' deals on "headphone deals" page. Sending headphones to headphile… I will give you my address if applicable, after payment by you. When sending headphones, DON'T send them in their original product box or foam (unless I'm buying them or Vixen). Wrap them with bubble wrap or similar instead (then put in a regular box). Modded headphones probably not fit back in it's original product box, so I will trash it, or you can pay separate shipping. You can "time" their arrival to actual approx build date, if you like. Will you work with other brands of cable or fix stock headphones… I will not modify, or use any cable other than headphile. I have no interest in fixing headphones unless modding, that's a job for the original manufacturer. 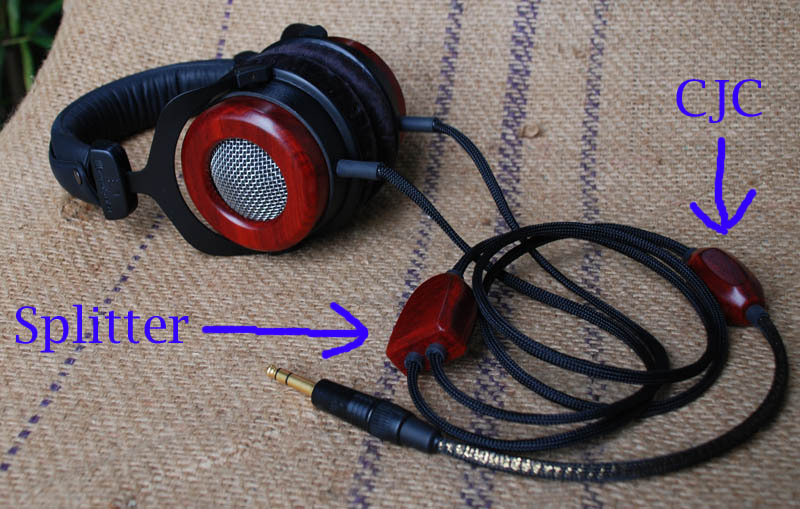 There are some exceptions, Grado the most likely I will work with somewhat (I'll shorten a cable or termination). Minimum is $30 plus shipping. I won't mod a headphone that's been modded in most any way by someone other than me without prior consent. Do you send take-off parts back to me… No, unless it's arranged before hand to send certain parts back, I do not send back unused take-off parts (screens, cables, etc). Parts value, however slight or large, are expected to remain with me as part of a purchase with no compensation other than the final product that was purchased. A shipping or other charge may apply for any parts that are returned by approved request from me. Do you sell parts, including Grado… Sometimes, but most will go on headphone deals page. You can email too, if you're specific. Previously modded headphones… by someone other than myself will almost always be rejected. There are exceptions, which must be approved by me before hand and may cost additional. I really don't want to deal with other peeps screw ups, stripped screws, bad glue jobs and such, which seems to be the norm rather than the exception. How do I care for wood… Products leave here with a coat of Carnauba wax as the final finish (Trewax or Meguiar's). You can use the same and buff as per directions. If you get scratches that won't wax out, you can use #0000 steel wool (and some common sense) over the area then wax and buff. Don't use or store wood products in sunlight as wood discoloration will result over time. Never use petroleum based products. Avoid cold to warm or hot temp changes, finish could craze or crack. Don't store wood in a hot car, or in the sun (even through a window). If you live in a dry climate, you probably already know that sometimes wood cracks. I can repair damage for a fee. A trick for touching up black… Sometimes the heat shrink glue that seeps out the ends yellows over time. Sometime you may get a scratch on your black Grado screens, or something else black. Use a black permanent marker to "adjust" the area in need! Can I phone you up… As much as I enjoy chatting on a phone, I just don't have the time… plain and simple. I will accept no calls unless I arrange them. No pick ups, meet ups or drop ins will be accepted, unless I invite you personally. Can I take advantage of your website mistake… No, I won't honor a website mistake in pricing. I'm human so please allow me to make an occasional mistake in pricing and fix it before you attempt to put the screws in me :-) If you have "scripting" turned off on your browser, PayPal shopping cart won't work properly. Prices will default at their lowest and won't change with different, more expensive lengths etc. If an order like this comes in, I will cancel it along with an explanation of how to properly order. As stated elsewhere on the site, I reserve the right to cancel any order for any reason. If you come across a code bug, an email will be appreciated to point me to it. Driver might be blown or something is off sounding… I test all headphones I build before they ship (even with very low bass). Once they are in the mail, there is NO warranty on drivers. Drivers can be blown the first second (first day, first month, first year, etc) they are used by you, whether a fault in your equipment (such as voltage issue), too loud a volume, pushing too much bass (specifically sub bass) or whatever. The simple truth is that I can't afford to fix an accident you may have. I can however, replace drivers for a price plus shipping both ways. Sub bass or very low bass… Can possibly damage your drivers. When recording this type of sound, I can assume it was intended for sub woofers… headphones are not sub woofers. Refer to "Driver might be blown" above, as I would suggest caution that you may be asking for trouble and expense. A car is not meant for off-road use, and certainly a dealer wouldn't replace the car if you wrecked it off-road (or anywhere else, at least for free). Nor are headphones meant for sub bass IMO. Not that it would stop me from listening to it if that's what I liked, but I would know I was doing it at my own risk (as will you be doing).